Early last week CARE took a little roadtrip to pick up a new resident. 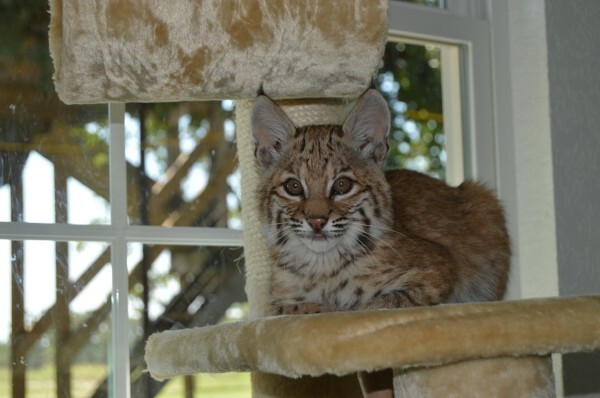 Meet Max the 5 month old bobcat! Max's story is unfortunately a common one for young bobcats. His mother was shot and a game warden found him orphaned. He took him in, and then relocated him to a wildlife refuge. The refuge asked us if we could give him a permant home. By this time he was too habituated to people to be rehabbed and released. He arrived at CARE late at night and the next morning got a clean bill of health from Dr. Bill. Now it was time to see if he and Mia could be friends. 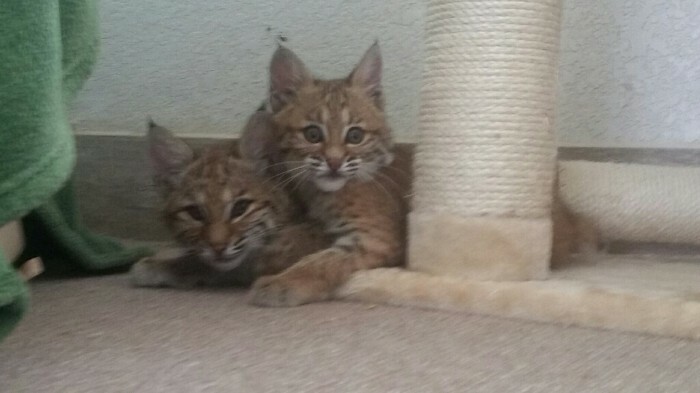 With him being twice the size of our first bobcat rescue, we hoped that their youth would make the introduction go smoothly. We could not have asked for a better outcome, it was love at first sight! In the last few days, they have spent their time cuddled up together for naps, staying up all night long to play, and hanging out on their window perches and cat trees to watch the birds outside. Max is very protective of Mia, and Mia is in love with boy. They chat all the time, calling to each other with chirps and gurgles and comforting each other with the loudest purrs you will ever hear! It is a beautiful thing to see them with each other, knowing that despite their hardships in the early stages of life, they now have each other. Right now they are taking advantage of the sunroom that was built for Araali and Zuberi. They get lots of sunshine, room to run and play, tons of toys, a snug den to sleep in, and giant cat trees to climb and look down at their CAREtakers from. We hope to have a permanant enclosure finished for them in the next month or so. Until then, Max has really settled in and both bobcats are doing so well it makes our hearts swell. Again, as we mentioned when we announced Mia's arrival, we want to a moment to please ask everyone to be careful if you come across any injured or abandoned wildlife. Not only can even a young animal bite and cause you harm if you disturb it, but they can become very quickly used to people. Once they see humans as a source of food, fun, and comfort, it severely decreases their chances of being returned where they belong. If you come across a baby bobcat, raccoon, bird, etc. please contact a rescue, rehabilitator, or authorities. They will know how to properly handle and care for the animals to give them a better chance at returning home in the wild. Also, if you live in areas where there are bobcat populations, there are alternatives to shooting the cats that may threaten your pets, chickens, or property. Animal conflict does not have to end in death, and the potential orphaning of offspring. Keep your pets inside. Protect your chickens with fencing and housing. Keep bright lights on. There are many options for deterring predation. Not only do we hate to hear of these animals being killed, they are important to controlling pests and help keep the ecosystems that we all live in healthy.